Accuracy ±0.03 mm After Sales Services For any queries please contact Customer Service Number - 1800-425-8665 (Toll free) Air Volume 240-450 L/min Application Stripping Paint and Varnish Shrink Tubing Shrink Film Shrink Wrap Packaging Dry Out Samp Wood Bend and Weld Plastic Soften Adhesives Thaw Frozen Pipes Brand Name Bosch Color Blue Contents In The Box Main Unit Warranty Card Manual Cord Length 2 m Frequency 50/60 Hz Item Weight 750 g Material Type Plastic Model GHG 500-2 Part Number 0 601 94A 050 Power Consumption 1600 W Product Dimensions (LxBxH) 28 x 27.2 x 9.6 cm Temperature Control Setting Yes Temperature Range 300 - 500 Degree C Variable Heat Setting 2 Stage Voltage 220-230 V Warranty 6 Months Warranty Terms & Conditions Valid only through seller/manufacturer; Tolexo is not liable for any warranty claims. Please read the usage manual available with the product to understand product usage and warranty T&C. Any other information regarding warranty can be obtained from brand website or by contacting seller.How to Claim Warranty 1. Please contact the Authorized service center of Brand (list available online) for claiming product warranty and service related issues. Key Features Stationary working position also possible. Very efficiently use for heating. Two air flow and temperature stages thermal protection. 2-stage switch for one-handed operation. Special Features Removable protective pipe. 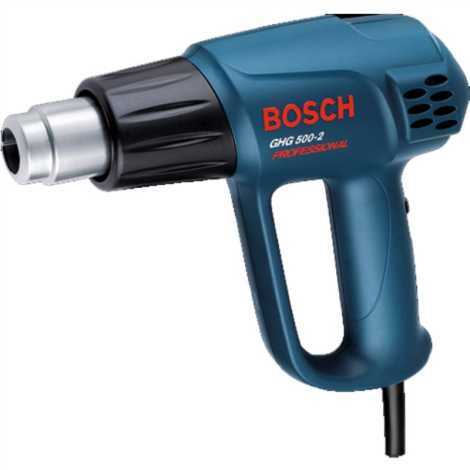 This electric heat gun has a 2-stage switch for one-handed operation and has an ample gripping area. It also has the option to store two main applications permanently so that both temperature and airflow and at the correct setting instantly. The working temperature of the heat gun makes it extremely efficient to heat, mould, solder and cut through tough materials.